Posted by dan bertolet on	Monday, June 9th, 2008 at 12:25 am. You can follow any responses to this entry through the RSS 2.0 feed. You can leave a response, or trackback from your own site. Love the sculpture park but can’t say I’m a fan of the visiting large cones. Is that really art? Come on! Dan’s photo begs the question, which is more interesting : the park’s contents, or its surroundings? Friends of mine are highly enthusiastic about the Sculpture Park. A happy long-term synergy of park and surroundings does appear in the offing. Myself, I’m still waiting to visit this park by clement weather. 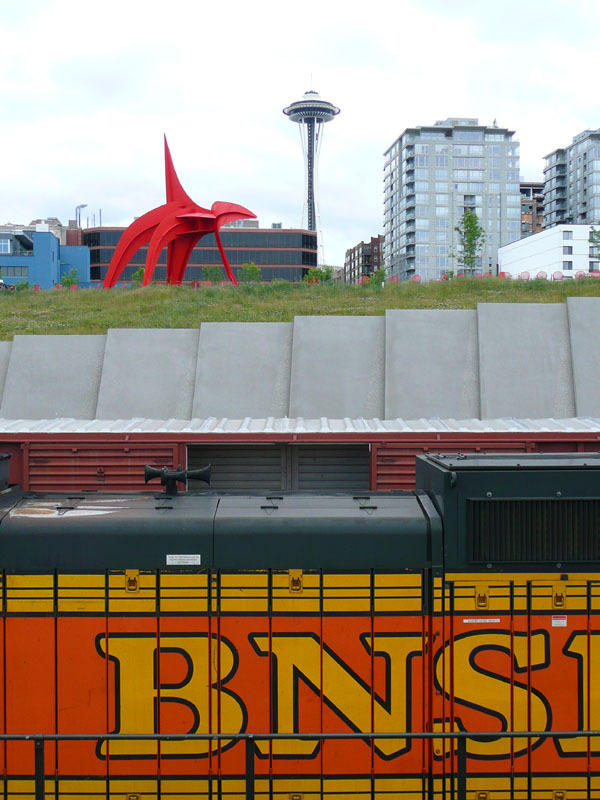 Dan has devoted many postings in this blog to downtown Seattle’s public spaces. Often he asks us to consider their frequentation. Aside from the spontaneous (and valid) observations that downtown Seattle’s population is not yet sufficient to animate its public spaces, and that downtown’s residents mostly work during the day; too, that these spaces are in many cases colonised by the druggies and the homeless, we tend to be left scratching our heads. Very possibly Dan is trying to jog our consciousness. Why, indeed, do people show such a limited enthusiasm for downtown Seattle’s public spaces? One part of the answer is that these spaces, albeit beautiful are not often comfortable. They’re cool, windy and wet most of the year. Although they do protect their users from the summer sun, they offer little shelter from wind and rain. Covered sidewalks, in the retail district, would seem a no-brainer. Wind- and rain-protected seating areas in the parks would seem another. Does anyone here know why such measures, familiar in other countries, have not been adopted? Sabina you expect too much of me. I only posted that photo cause I love the orange and yellow paint they put on those trains! Great question Sabina…I would guess there may be a number of factors why more shelter is not provided in our parks, but primarily costs related to maintainence and vandalism. You see we aren’t quite as civilised as our European counterparts…what countries were you thinking of BTW? Got any photos? Photos of park shelters? Alas, I unfortunately have neither photos nor the software. Which European countries? Switzerland, Germany and France are those I’m most familiar with. Lots of park shelters, in various forms. It’s true that vandalism is generally not a big issue in those countries. Too, that park shelters there often possess some retail function (food, magazines), which discourages vandalism. Regarding our frequently windy and damp downtown Seattle, I can relate some encouraging news. At a design review meeting held this evening, a representative from Foster+Partners presented the reworked draft for Civic Square. F+P, he explained, had sent its consultants to evaluate the site for wind and pedestrian traffic flow. F+P in consequence subsequently redesigned tower, plaza and light rail station, with the goal of creating an optimally animated, truly all-season public plaza. Wind currents through the plaza henceforth are minimised; there is abundant rain-protected outdoor circulation and seating area within the plaza, on multiple levels; the plaza is given a pleasing sense of enclosure. Even the elevations, in horizontal bands of white and clear glass, are shaping up nicely. Kudos to (the European firm of) F+P! I also learned that Seattle building codes actually specify sidewalk canopies. F+P in fact asked for several variances, demonstrating that canopies would be problematic to integrate along the James St. (vertical garden) and Cherry St. elevations; too, that overhangs integrated within the structure would largely compensate, along Cherry. It surprised me to learn that building codes here ask for canopies. The Colman Building, on 1st Avenue, has a very very wonderful canopy, and of course Frederick’s and Au Bon Marche, but these are all from a previous era. Most of the modern-day canopies in downtown are so stingy, and so intermittent, as to be of little help. The surroundings are certainly part of the park, in fact I would say that it is a significant architectural achievement in itself. I especially appreciate the way it incorporates Western Ave and the BNSF tracks instead of acting like they aren’t there. Instead of a soundwall, you can take fantastic pictures like this one. Also interesting to mention shelters in this context as the Olympic Sculpture Park has a pavilion at the top, and the bottom is right next to pier shops. Additionally when the trees grow more I think they will cut down on the wind, though it will always be nicer in August.